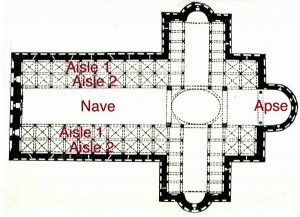 Some big basilicas and churches had two aisles instead of one: double aisles. 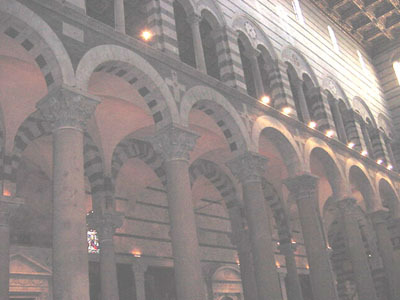 The big cathedral at Pisa (the Duomo), has two aisles. See the two rows of columns? Why do some churches have double aisles? Very big churches needed double aisles. The extra row of columns helped to hold up the heavy stone roof. Double aisles also made room for more activities inside the church. Because medieval churches were the biggest indoor spaces in their towns, people didn’t only use them for religious services. Churches were also used for weddings (as they are today), graduations, big parties, town meetings, concerts, criminal trials, and sometimes even farmer’s markets. Here is a floor plan of Pisa Cathedral, looking down at the church as if you were floating over it. You can see the four rows of columns, and the side aisles, and the apse at the other end. People sometimes said that churches like this, with a main nave and two side aisles on each side of the nave, had “five naves”. Learn by doing: is there a church in your town with double aisles? Cite this page: Carr, K.E. Why are there double aisles? History of architecture. Quatr.us Study Guides, May 24, 2017. Web. April 21, 2019.